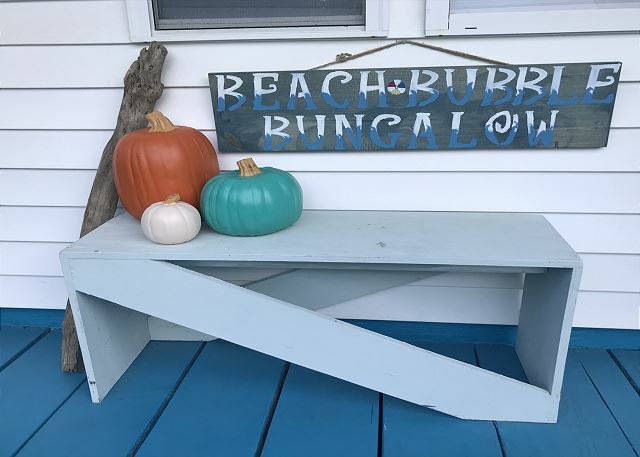 Beach Bubble Bungalow was built in 1950 and expanded in the recent years! 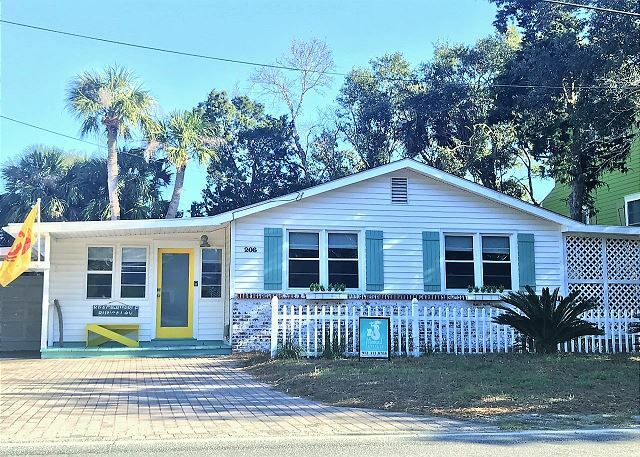 What a classic Tybee charmer with vintage, modern and vintage-modern touches! 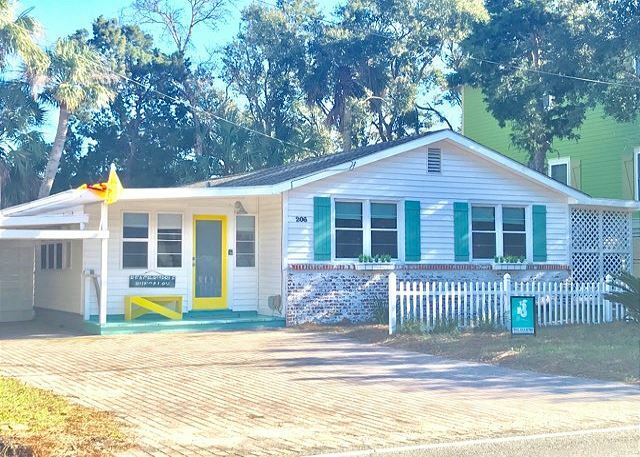 Adorable retro-modern Beach Bubble is across the street from Maddie's on Jones, Blues Away and Mimosa cottages, so you can bring the whole fam! 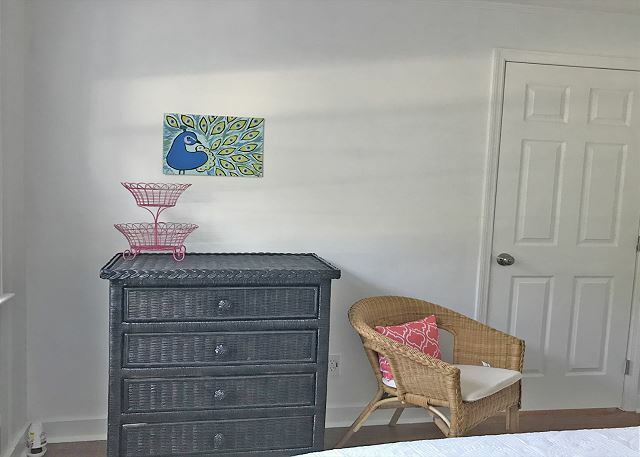 Coastal, Clean and Comfortable. Get cozy any time of the year. Enjoy the open floor plan that makes staying together yet having private space perfect for a family vacation. This room has a tv with wifi, cable and Netflix. 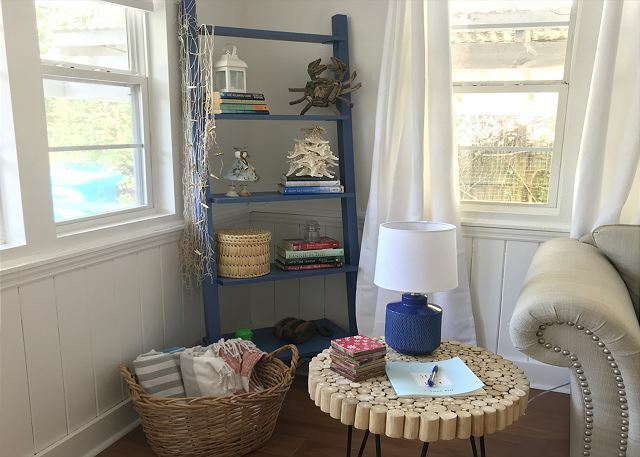 The home is outfitted for your comfort needs with throw blankets, coastal inspired reads, and please don’t forget to sign the guest book! 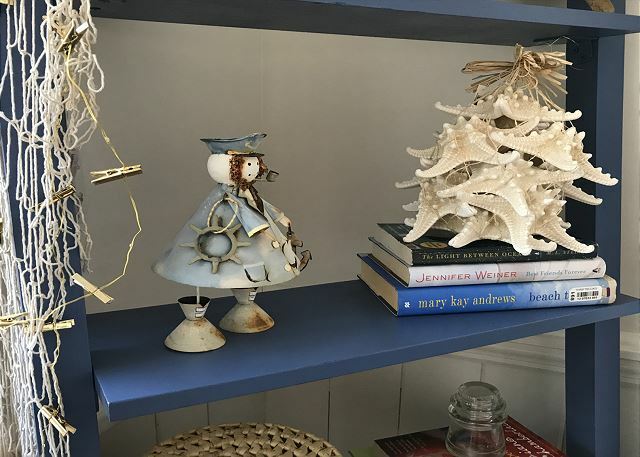 Coastal charm and good reads. 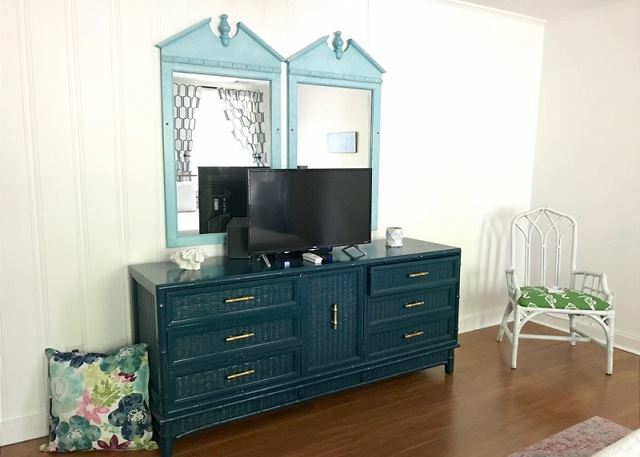 This room has a smart tv with wifi, cable and Netflix. There is also a DVD player and a collection of movies and a vintage inspired record player for some classic nostalgia. Drift wood accents and cozy chairs. Spend your relaxation time or grab your loved one and dance the night away to the sounds of vinyl. A small record collection is on hand or feel free to bring your own. After a day playing by the sounds of the ocean waves, come back to the bungalow and spend an evening at home with the sounds of vinyl. That is a perfect day. 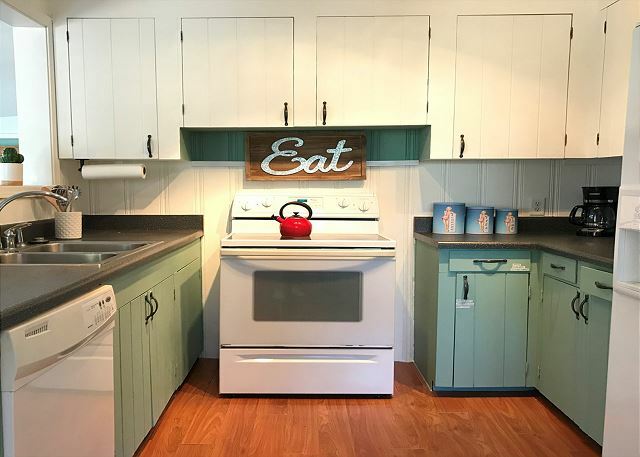 Authentic 50’s kitchen painted seafoam green. A cheery space to make yummy memories. 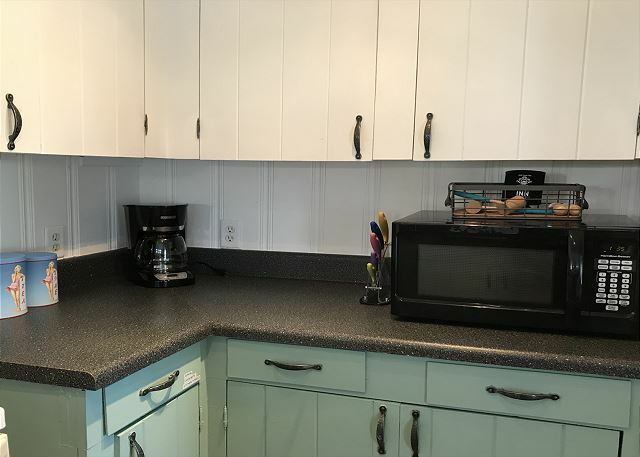 The kitchen is fully stocked for your stay. The above cabinets have lots of pantry space for guests to make themselves at home. 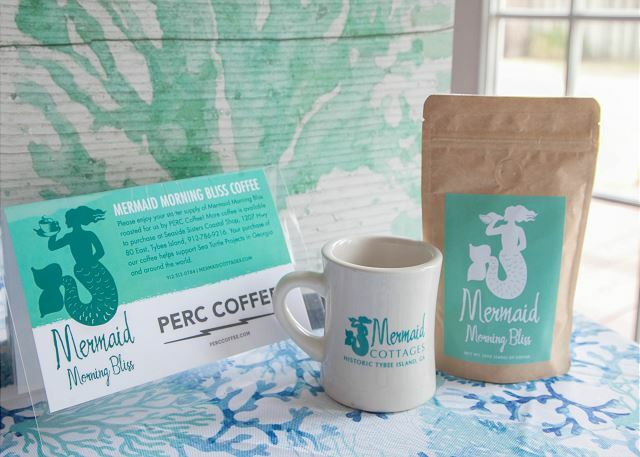 Enjoy our very own Mermaid Morning Bliss coffee (MMM Bliss!)! Available for purchase at Seaside Sisters. Proceeds support sea turtle preservation! Colorful chairs and a large table to have large meals and family fun at. Seating for 6. The living room has additional picnic table-style seating! Vintage charm is around every corner. 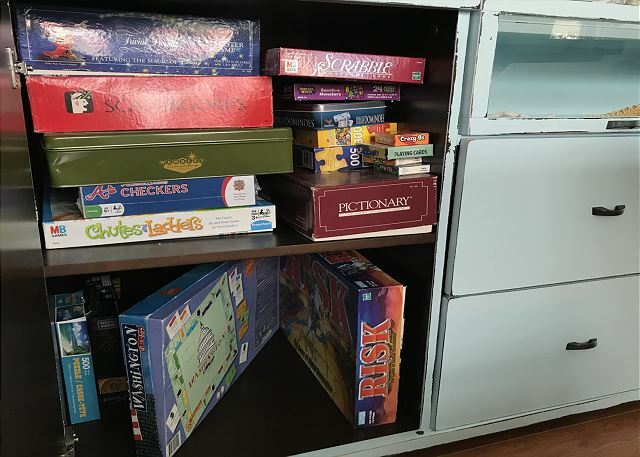 The hutch holds everything you will need for your stay! 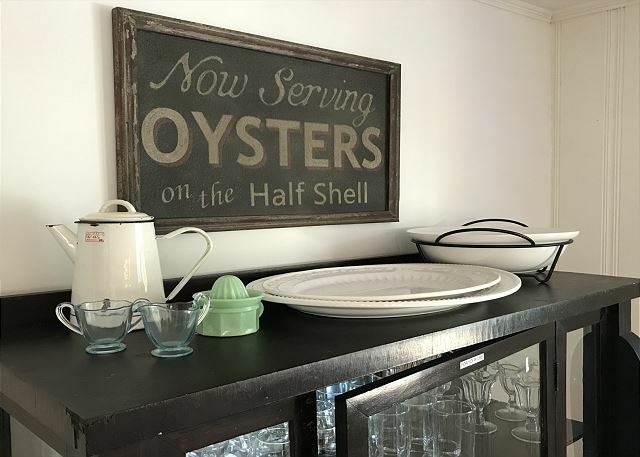 From wine and champagne glasses, serving platters, ice cream glasses and everyday essentials. 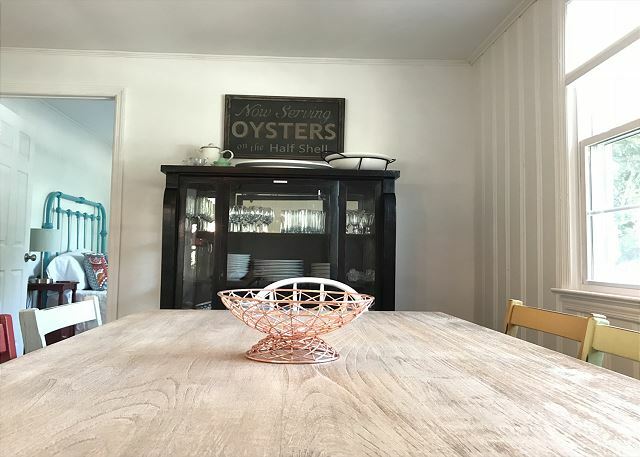 This coastal farmhouse dining room is waiting for your vacation memories. 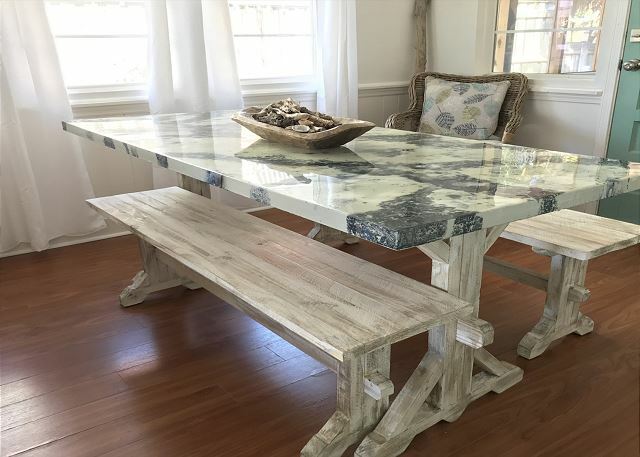 Hand-crafted and made of resin, this table top looks like the inside of an oyster shell. 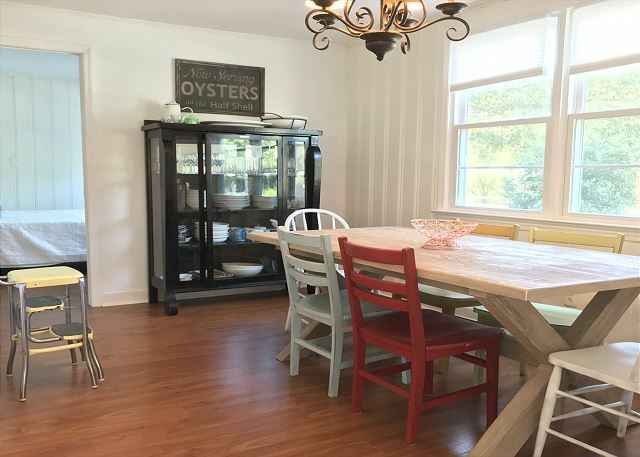 Enjoy your family meals or playing games in this fun and pretty space. 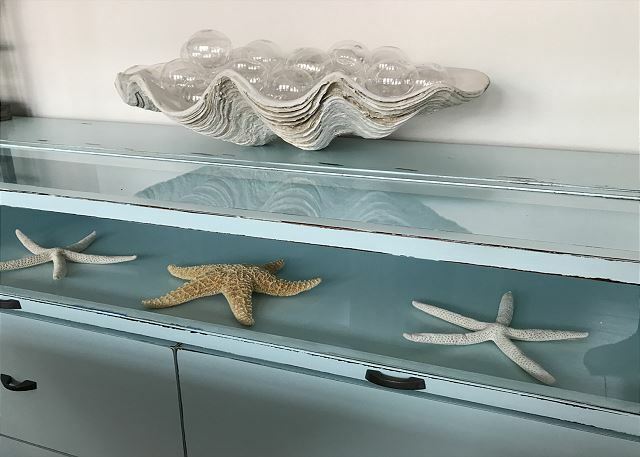 Unique furniture finds and coastal decor. And of course our very own beach bubbles. 10 beach bubble beach towels are provided for you! 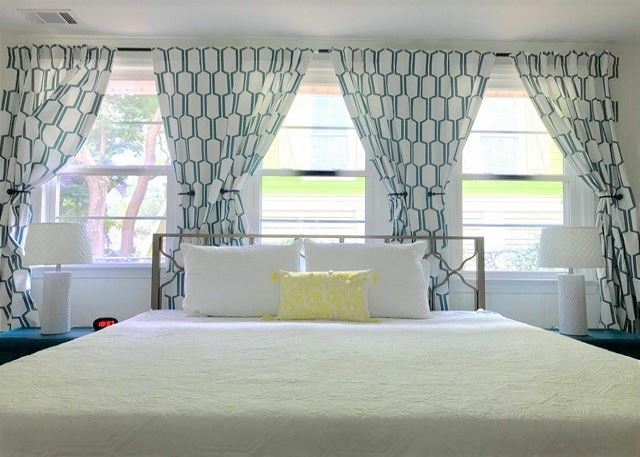 Master Bedroom ~ Large, airy and outfitted with a brand new spa Green Tea king mattress for your comfort. Also a equipped with a 9 drawer dresser. Has a gorgeous en suite bathroom! King Size Green Tea Comfort Mattress for maximum comfort. The king master bedroom has a smart tv with cable, wifi and Netflix. Fabulous en suite bathroom with amazing standup shower! It's the littlest of details that make the biggest impact. Lovely touches make you feel right at home, but even better! Flat screen TV for your viewing enjoyment. 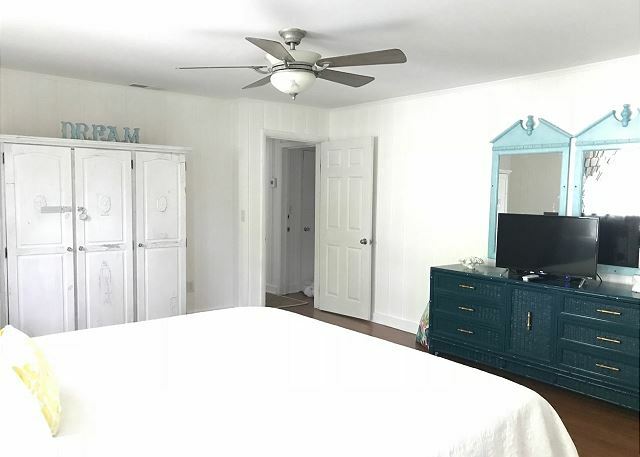 Two full beds, tv, six drawer dresser and large closet. These full windows are amazing for morning light! 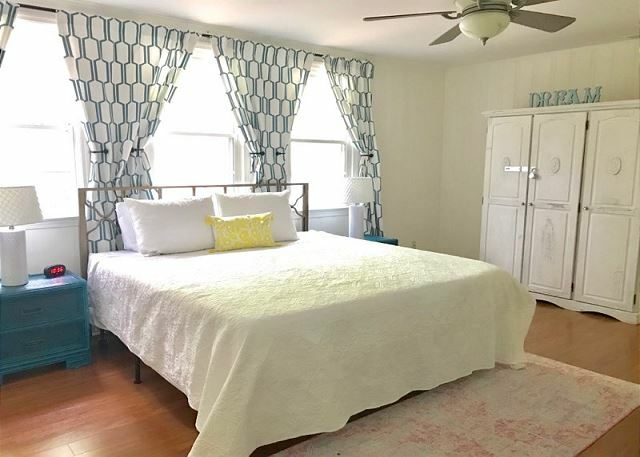 This two full bed bedroom offers a smart TV with access to cable and Netflix. 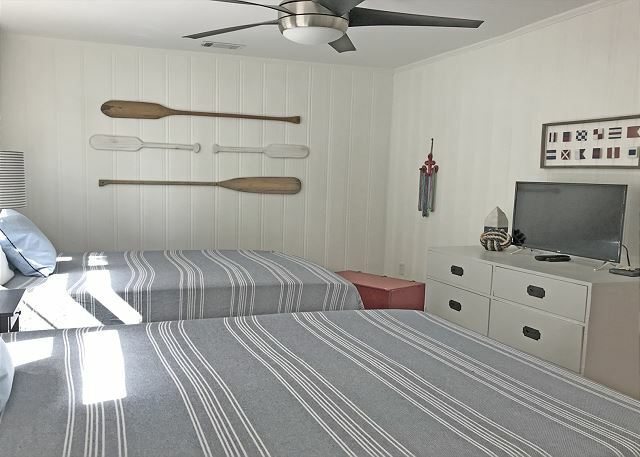 A happy colorful and airy room inspired by wooden fishing boats. 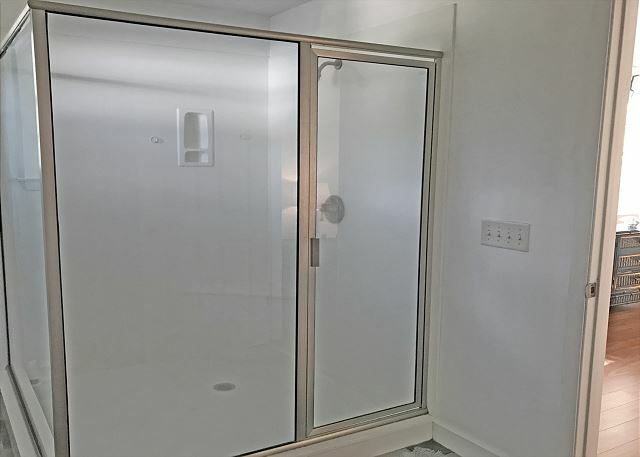 Master bathroom - really, really, really large shower. 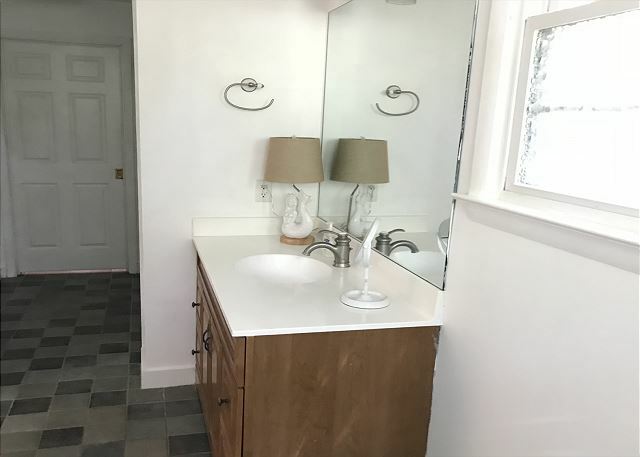 The master bathroom has two large closets for all of your storage needs. 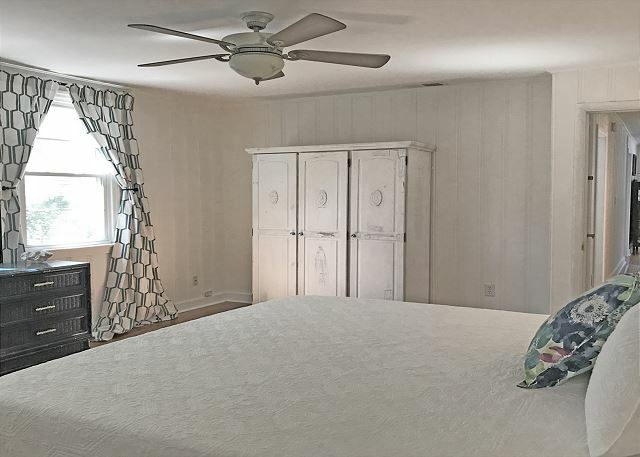 This room leads into the laundry room with washer and dryer, hampers, iron, ironing board and lots of shelving for your storage needs. 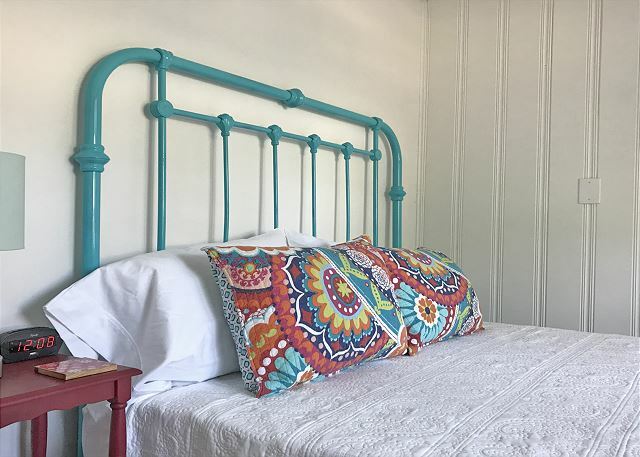 Single queen room ~ A queen green tea spa mattress and beachy bed! Perfect! A happy space! Queen bedroom with one comfy queen bed. Single Queen Room ~ colorful and airy. Spare full bath ~ Full bathroom with bathtub. Blow dryer provided. 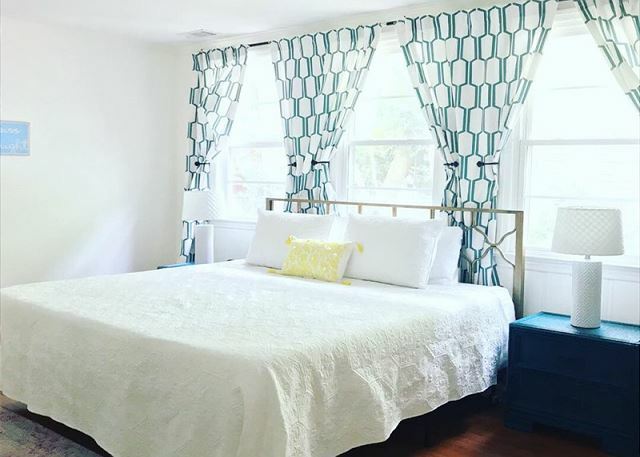 This bedroom has two queen size, Green Tea spa mattresses, a large closet and dresser. Clean, airy and relaxing. 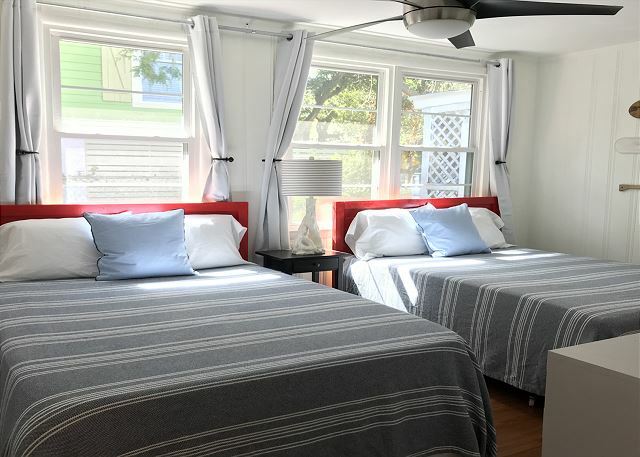 Double queen bedroom is just waiting for fun beach secrets and lots of great, satisfying rest! 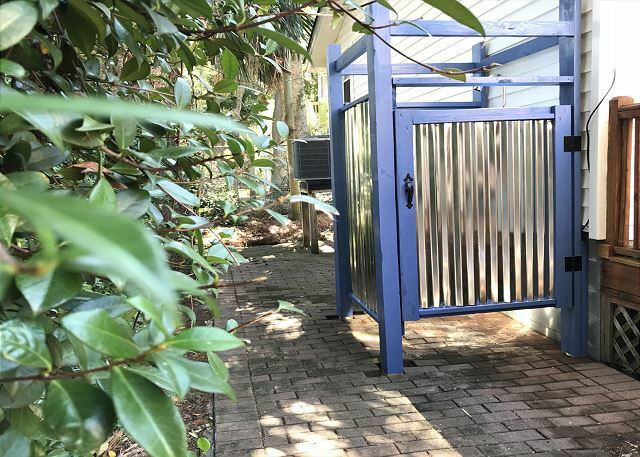 Fully screened in porch ~ Some fun for everyone. 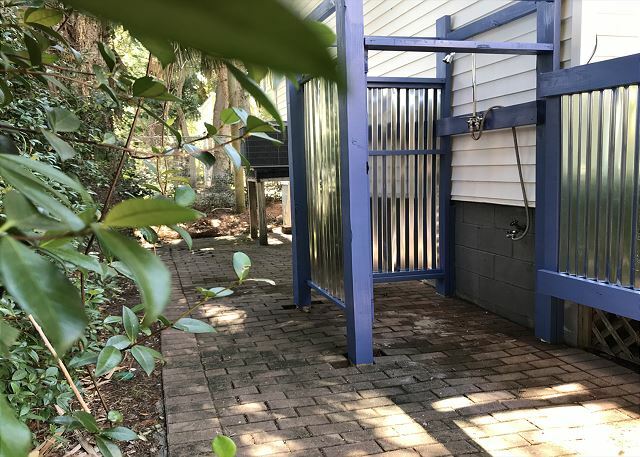 Leads to backyard with outside seating and fire pit! 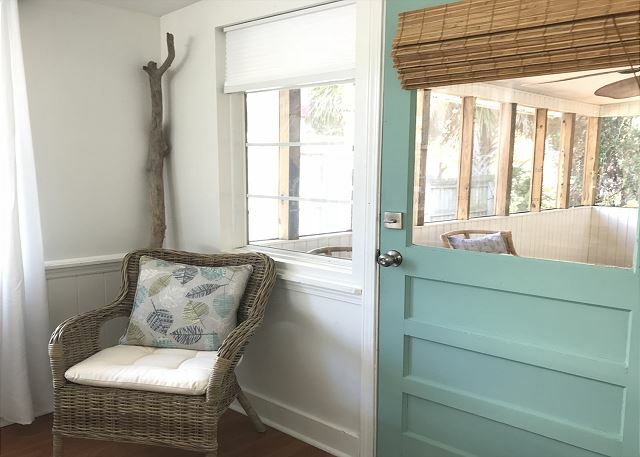 Escape the heat on your own southern screened porch. Outdoor Shower ~ Imagine showering outside under palm trees! Glorious! A large and private space to remove the sand from your fun day at the beach. Shower among the palm trees! Heaven on Tybee! Patio ~ relax around the fire pit under the palm trees. Patio ~ firepit, bbq grill, and outdoor patio table on a Savannah inspired brick patio. Patio ~ At night, turn on the patio lights, with a simple flip of a light switch, for a truly charming outdoor space. Patio ~ steps lead to the back entry of the large screened porch. Beach Bubble Bungalow is named for the sea foam that washes ashore. Come see us soon! 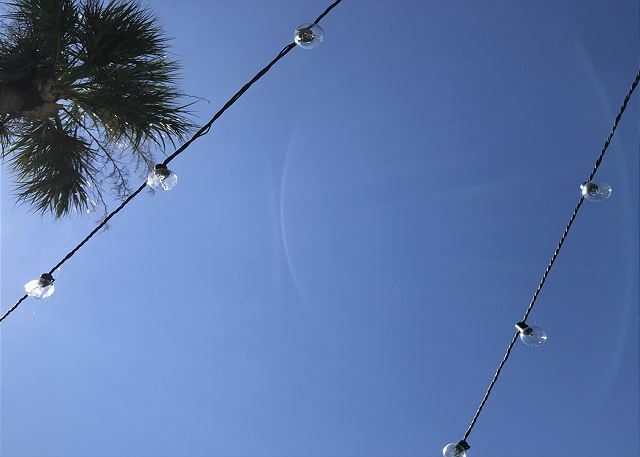 When you lean back in your adirondack chair and look up at the sky, it’s pretty perfect. You can see the ocean and sand from our stop sign. It’s a quick and easy 3 blocks. Beach Bubble Bungalow a fun and happy home named after seafoam. 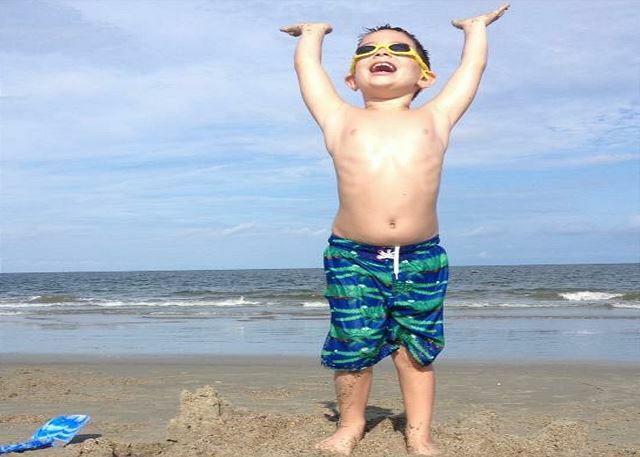 The tiniest of the homeowners, feeling like he is king of the world on Tybee. 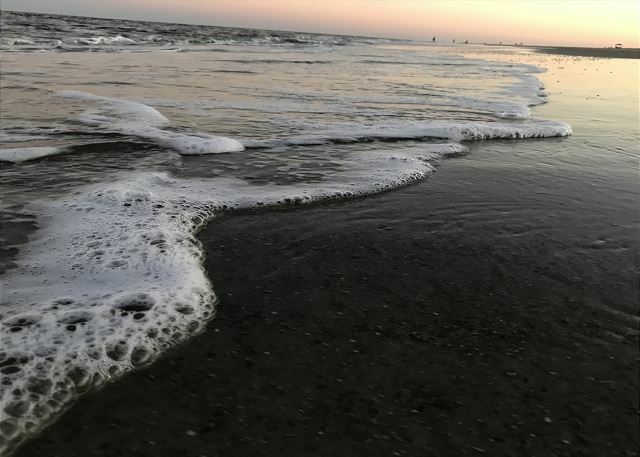 Come unwind and get on Tybee time! 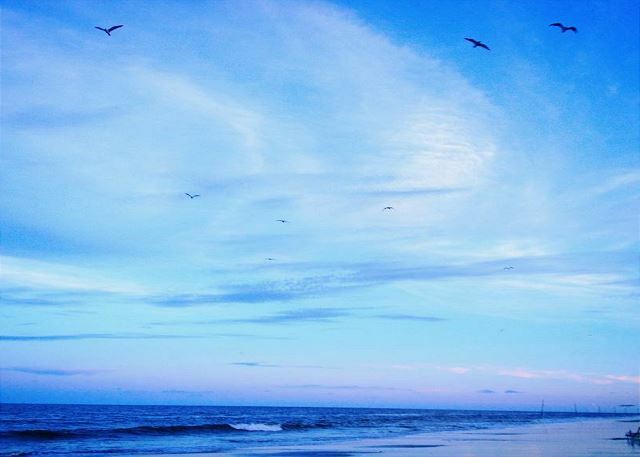 Be the first to breathe the fresh sea air before the rest of the world! This home is a home. What? That means it has all of the comforts that you need for your stay, no matter how long. Ample comfortable seating. An open floor plan and private spaces too. 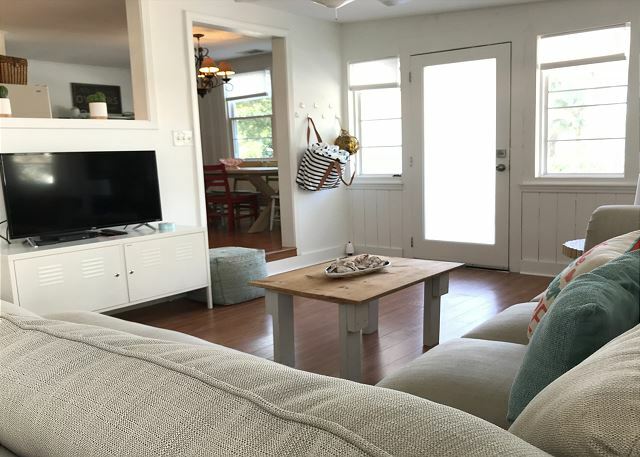 This home is where coastal, charm, comfort and cleanliness combine. 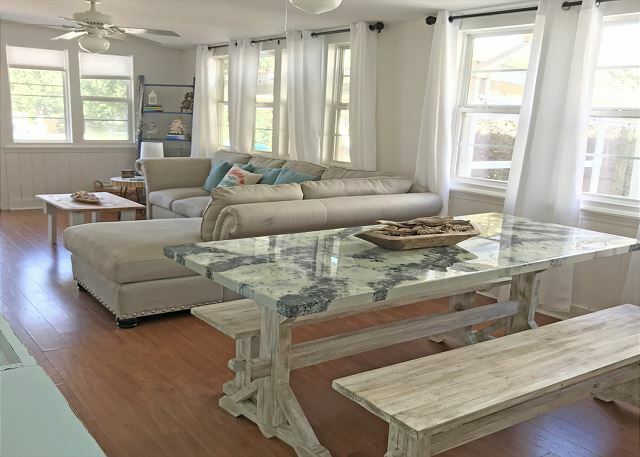 Located in a central location, this house sits in a family friendly spot. (A quiet break from the bar scene that isn’t too far away, but far enough for a peaceful evening.) 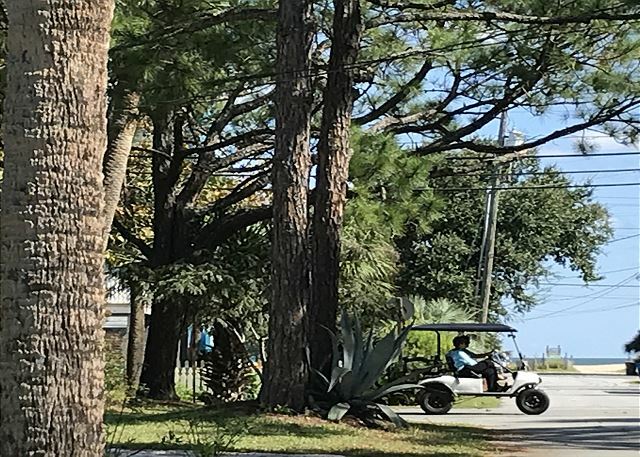 It is just a quick bike ride to the Tybee Lighthouse, and most importantly, only a very short walk to the beach. 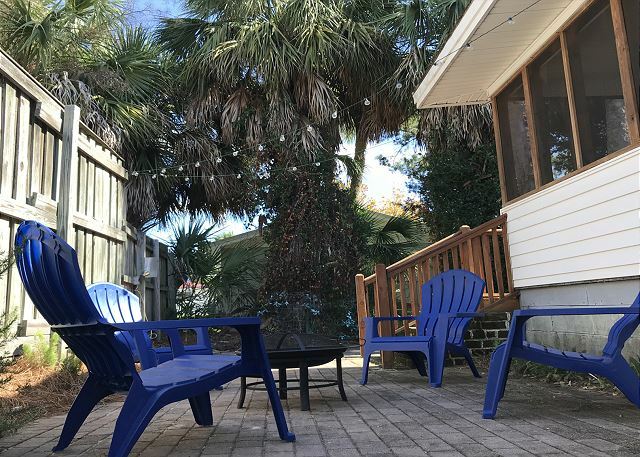 This house sits 3 small Tybee blocks from the sand. 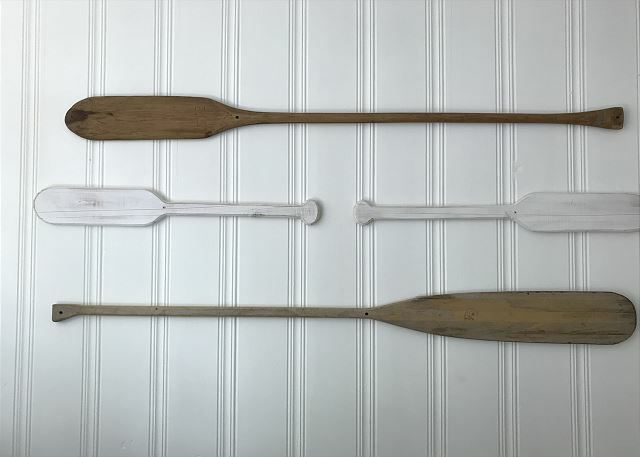 The owner’s children measured! Only 900 feet! From the stop sign, you can see the ocean. And according to them, most importantly, only one block from the bakery and ice cream shop! A convenience store, deli, a pizzeria and two restaurants are only a block away. 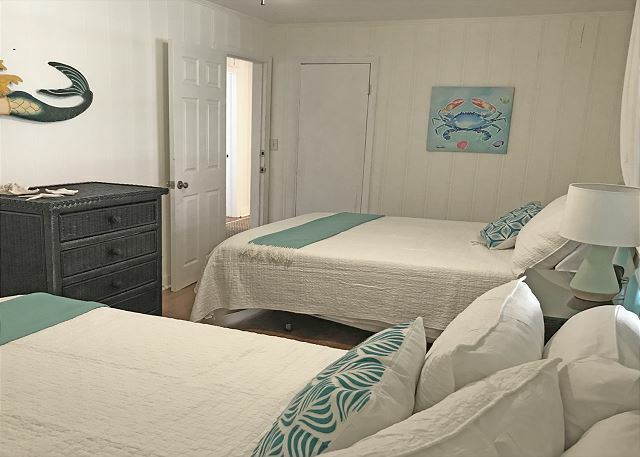 Also, several Mermaid Cottages are across and down the street for family convenience ~ Mimosa Cottage, Maddie's on Jones, Blues Away are all across the street, and a short block away are Livin' the Dream, Key Lime Parrot and The Shrimp. 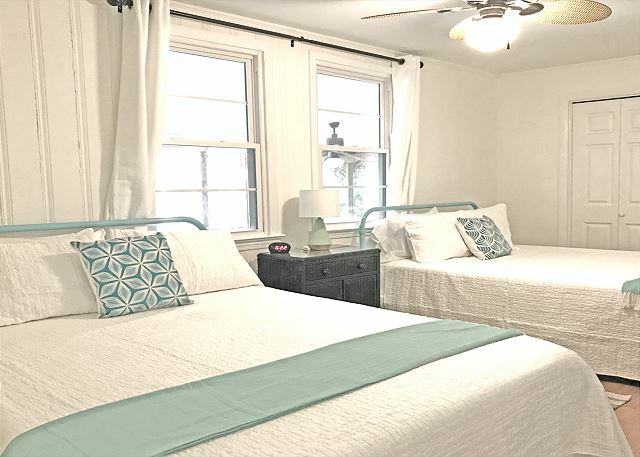 Perfect for families who want to stay close... but not too close! 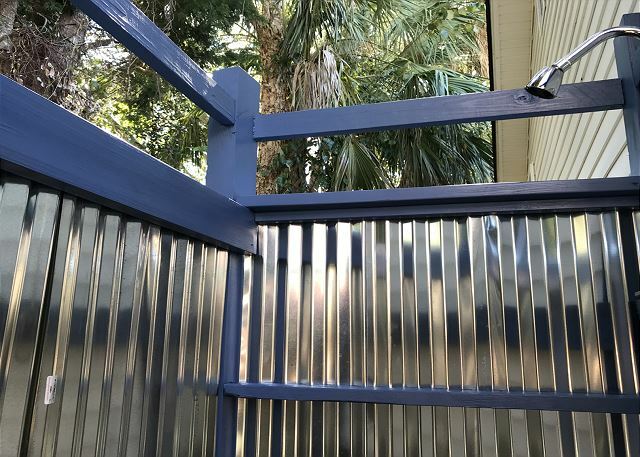 This house is brand new to the vacation rental world. The owners just purchased and furnished it in October. You may find price tags on some items in the house. 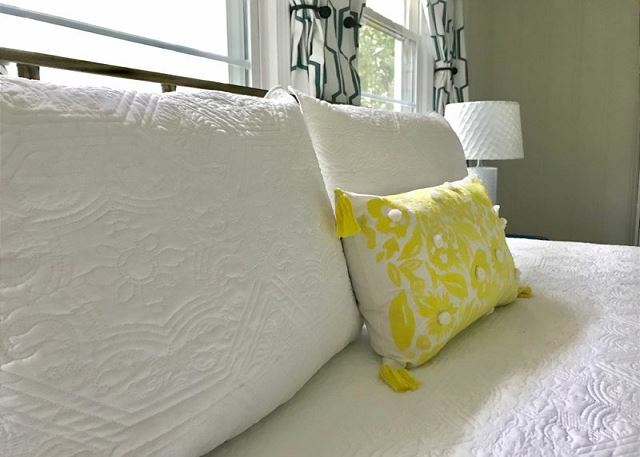 The house is outfitted with brand new green tea spa mattresses in every room and new towels. There are 4 bedrooms and 2 full baths. There is a king bed in the master. 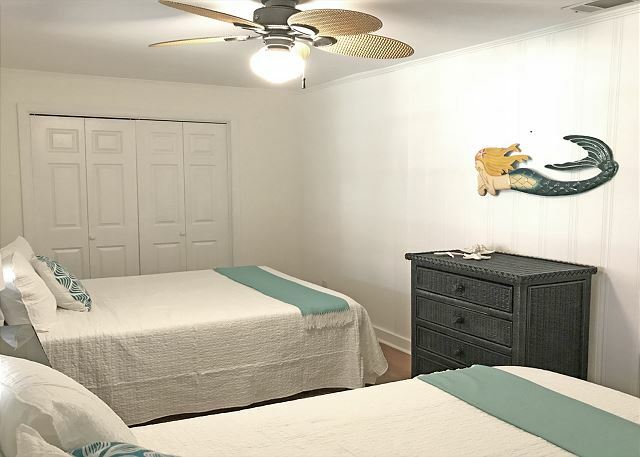 The first guest bedroom has two queen beds. 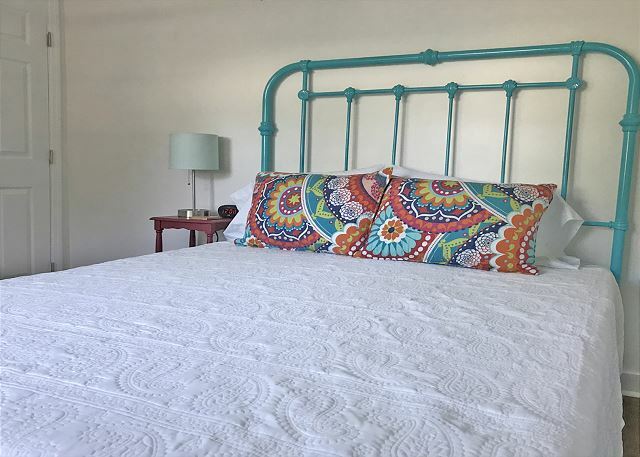 The second guest bedroom had two full beds. The third guest room has one queen. It sounds spacious and it is! But it is also cozy for tiny families and couples. 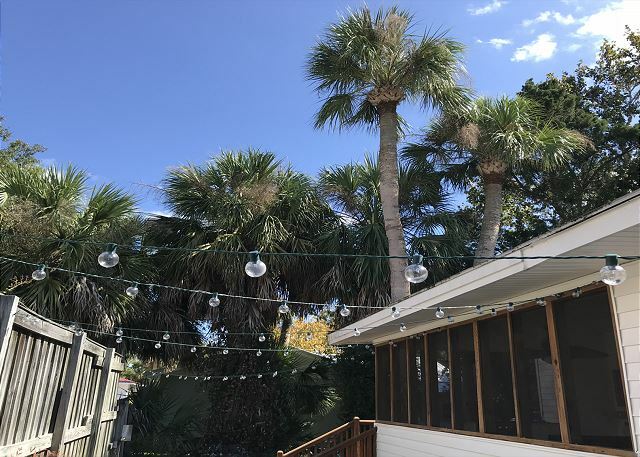 After a long day on the beach, enjoy rinsing off in a private outdoor shower under palm trees. The outdoor space has a private wrap around brick patio adorned with patio lights. 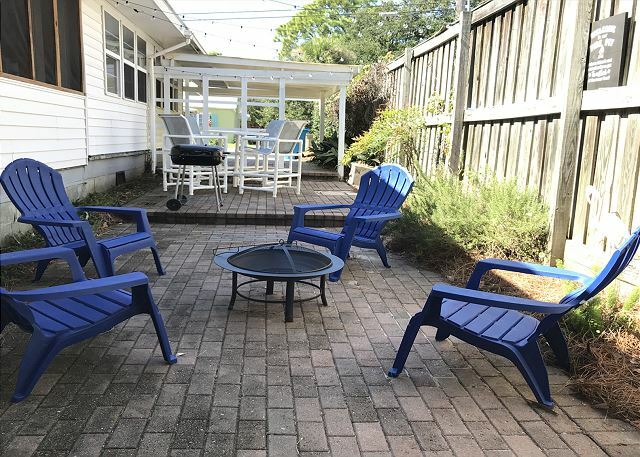 There you will find the BBQ, outdoor patio table and fire pit. Note: Guests need to bring their own firewood. 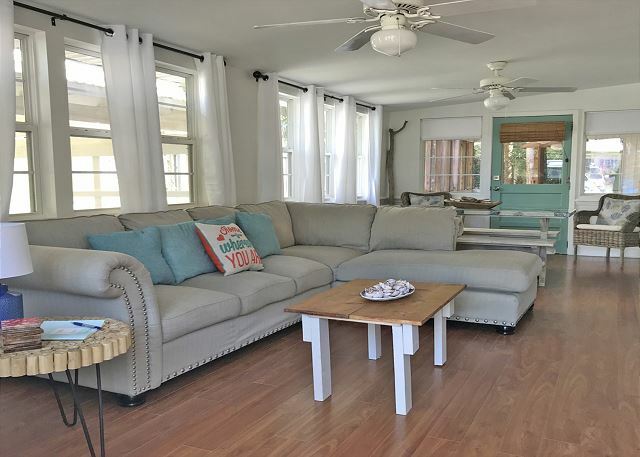 If you’d like an escape from the sun enjoy relaxing under the fans on the large screened porch. 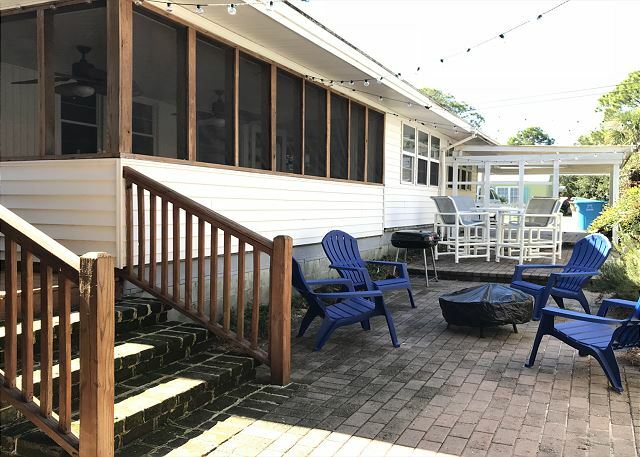 For your entertainment the house is equipped with a foosball table, dart board, board games, puzzles, a vintage style record player, beach chairs, boogie boards and coastal inspired books. There are three Smart TV’s with cable, Netflix and wifi. There is also a DVD player and some movies. 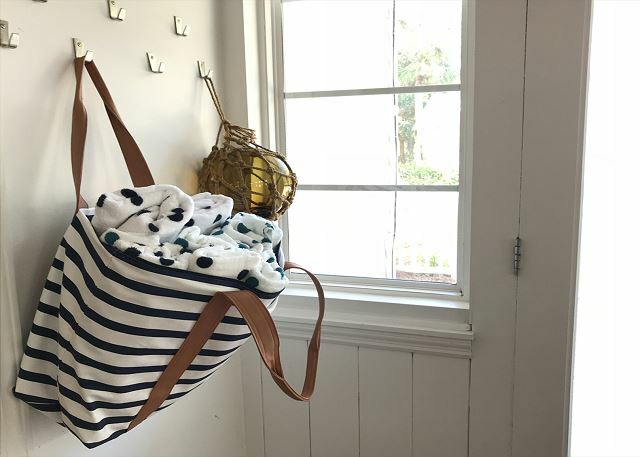 For your comfort the home has throw blankets for those cozy coastal nights and beach towels for your sandy naps on hot days. If sitting is more your style, there are beach chairs for your use. Don’t forget the cooler that is also supplied. For your convenience there are wine glasses, champagne glasses, serving dishes, along with everyday kitchen needs. It also has two blow dryers and a flashlight in every room should you enjoy a romantic and coastal beach storm. There is a washing machine and dryer for your convenience. This home also takes care of you car, with a carport to keep it cool and two additional off-street parking places. Please note: Longer minimum stay requirements of up to 7 nights will apply during certain times of the year, including holidays and our summer season. Had a great visit. Love the back screened in porch. Only improvement would be to have mirrors in each bedroom. Loved the place and location.